How do you know if you have Fibromyalgia? Fibromyalgia is a non-inflammatory chronic condition accruing in the soft tissue areas of the body generally causing pain and tenderness particularly in the neck, Shoulders and low back regions. Fibromyalgia is thought to have multiple contributing factors which pertain to physical trauma, such as a motor vehicle accident, a bad fall, or an undetected infection. However scientist can’t say for certain what the exact cause of Fibromyalgia is. Current research suggests that Fibromyalgia is a disorder of the Central Nervous System ( CNS) which has become hypersensitive. How are patients diagnosed with Fibromyalgia? To diagnosis Fibromyalgia the patient must have wide spread chronic pain in all four quadrants of the body that seems more or less continuous for at least three months. 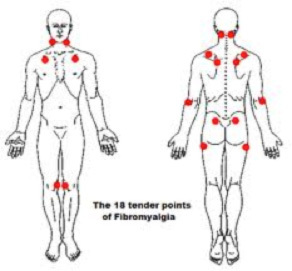 The patient will exhibit pain in at least 11 of 18 tender points. Front and Back of the Neck * the Mid- to Upper-Back of the Shoulders. Studies have shown that a combination of magnesium, along with malic acid and B vitamins may also be helpful stress-managing strategies and encourage better sleep. There is no cure for Fibromyalgia, but Chiropractic treatment has helped many people by reducing their symptoms and improving quality of life. Because Chiropractic Care is based on the theory that an individual’s health is controlled by the state of his or her central nervous system, Chiropractors, who are experts in this area, are especially well suited to help patients reduce their Fibromyalgia symptoms. If you feel you have any of these symptoms or you know someone with these problems please call our office for a free consultation 239-936-6566. We accept all major insurances including Medicare, United health, Blue Cross Blue Shield, Car Accident Insurances and many more. Providing the most trusted chiropractic care to Fort Myers, Lehigh Acres and Cape Coral area residents.